What´s so special about 13000? After bouncing up and down around the 13000 level for a week, the Dow Jones Industrial Average finally closed above that psychologically important mark for the first time since May 2008. As last summer’s fears of a U.S. recession and a European debt collapse have gradually waned, the Dow has staged a 22% rebound since early October, and its 6.4% gain for 2012 marks the strongest beginning to a year since 1998. Stock indexes rose but gave up earlier gains after a morning of choppy trading that followed mixed economic data. Still, the Dow ended up closing above 13000. Jonathan Cheng reports on the News Hub. With stocks up so far in such a short time, money managers find themselves torn between concerns the market is overdue for some kind of pullback and fears the market’s strength could leave them regretting any decision to get out now. But take a closer look. Believe me when I say that in July 1965 the Dow was around 800 points. 17 years later, in July 1982 it was at the same 800 points. 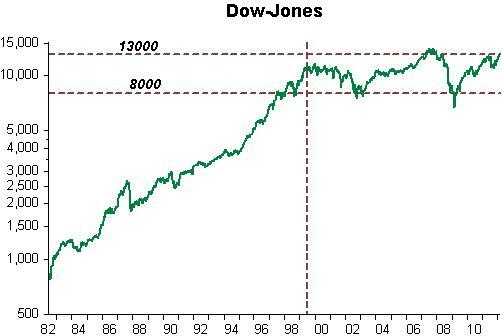 In the following 17 years to July 1999 it went up by 10600 points. But for the last 13 years it has just “bounced” along a 5000 point interval. Funny that just about the time the NASDAQ was in full swing, the Dow “capped”. Could it be that in mid 1982, just as inflation was being “trounced” and the door through to the “Great Moderation” was about to be crossed, the Dow began to “price in” a more lucrative future and 17 years later it began to “scent” unpleasant “smells”? At the time, Y2K was “in the cards”. Maybe the market “smelled” the balance sheet “shenanigans” that would be “unveiled” a couple of years later (and that had begun in 1997). Maybe it “figured” that having managed to obtain a fiscal surplus for the first time in many decades, the government would soon itch to “undo it” (and then some). Maybe the market “felt” that the economy was “overheating” and that the Fed would come down “hard”. Coincidentally, it “capped” just as the Fed began to raise rates in mid 1999 (rates went from 4.75% in June 99 to 6.5% in June 00). Certainly 9/11 was not “factored in”, nor was the Bush Jr. “penchant” for going to war. 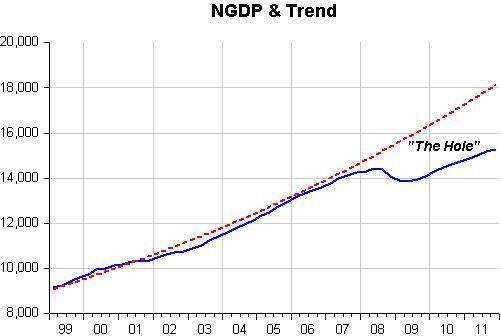 And most certainly it did not “contemplate” the big drop in NGDP that would take place 9 years later (for the first time since 1938) under Bernanke who at the time was “just” a university professor. So 13000 is just the “top” of a log running range. And that´s why investors feel the proverbial “chill in the spine”. As I mentioned a couple of days ago with reference to the S&P, “this stock market rally is not for real”. It´s just riding a “foamy wave of sentiment”. That´s been mostly true for the past 13 years. The “novelty” is that now the market´s “conduit” has been, believe it or not, inflation expectations. A hell of a “way to go”! The Federal Reserve Board announced on Thursday that Chairman Ben S. Bernanke will deliver a series of lectures aimed at college students. Beginning on March 20, he will lead four classes on “The Federal Reserve and the Financial Crisis” as part of a course offered to undergraduates at the George Washington University School of Business. The class will feature a variety of speakers who will discuss central banking. Chairman Bernanke’s lectures are scheduled for March 20, 22, 27 and 29 and will begin at 12:45 pm EDT. This should be interesting. Which Bernanke will the college students hear? The “Bernanke in theory or the Bernanke in practice”? Most likely the latter Bernanke, otherwise he would have a lot of “explaining” to do. 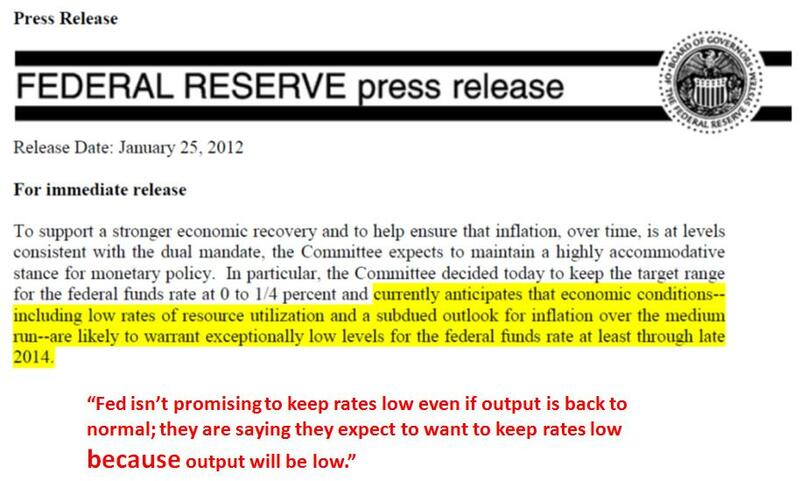 But take note, Mr. Bernanke, “we heard what you said last summer”. This is where “transparency” has taken us: to the “loony bin”! So let’s back up. At the zero lower bound, the only way to reduce the policy rate is to raise expected inflation. The Fed’s communication strategy seems designed to raise expected inflation, by promising to keep rates low in the future when the economy will probably be stronger. To the extent that markets interpret the statement in that way, inflation expectations should rise, the real interest rate should fall, and economic activity should accelerate. But, as the text in the slide indicates, a strict reading of the Fed statement suggests that the central bank is planning to keep rates low because the economy is likely to remain weak. In that case, the rate forecast wouldn’t be expected to raise inflation and wouldn’t be stimulative. I shy away from the strict interpretation of the statement, because it would make no sense to add the language in the first place if that’s what the Fed were actually saying. Perhaps too charitably, I lean toward a view that the Fedis trying to raise inflation expectations without spooking its critics, internal and external. Unless the Fed continues with its enhanced communications strategy up to the point at which communications are actually enhanced, we’ll all be left wondering about the meaning of the statement until the point at which the Fed is forced to show its hand. Unfortunately, oil-price dynamics may interfere. The trouble, as Mr Duy points out, is that an increase in short-term inflation due to rising commodity prices does not necessarily translate into lower real interest rates. It is expected inflation that matters, and inflation expectations may actually fall in response to higher commodity prices. A fun intellectual discussion might be to try and pick apart whether the drop in future expectations is due to the contractionary nature of dear oil or the central-bank response or something else. Whatever the cause, the upshot is that a rise in commodity prices which pushes up headline inflation but reduces medium-term inflation expectations is strictly contractionary at the zero lower bound. The right monetary policy reaction is not only to accommodate the oil shock but to ease into it. That will unquestionably be a hard sell to a central bank that understands all too well the lack of appreciation for the subtleties of monetary policy in Congress (and, honestly, at the top of many regional reserve banks). Try telling Ron Paul that you need to buy more assets to raise inflation, because higher oil-induced inflation is reducing expectated inflation. That’s where America may find itself, however. In short, a big enough rise in oil prices that translates into a big enough decline in expected growth and inflation may nudge the Fed from the rates-will-be-low-because-we-want-catch-up-growth interpretation toward the rates-will-be-low-because-the-economy-will-be-weak interpretation. Which would dial down the stimulative impact of the language from something to nothing. It’s enough to get one thinking that a non-inflation-rate target (like nominal GDP, for instance) might be more attractive from both an economic and a political economy standpoint. Perhaps unsurprisingly, Mrs Romer is on board. Any reader of this blog knows that I love to “illustrate” my stories, and I try to do that diligently so as not to confuse or misguide the reader. Unfortunately, many others don´t take that particular care and reach conclusions based on “optical illusions”. Recently I took Joe Wiesenthal to task for picking on a bad chart in a post by James Pethoukoukis and actually making things worse. Now JW is back at it, this time reproducing bad charts from a deeper study about the impact of housing on the recovery. Still though, what the above charts (plus others in the paper) show is that this recovery is just not that unusual compared to past ones. There are a couple areas that really stand out to the downside, but in most of the categories, the bounce back has been alright. That´s the sort of (wrong) conclusion you arrive at by looking only at “growth rates” and ignoring “levels”. 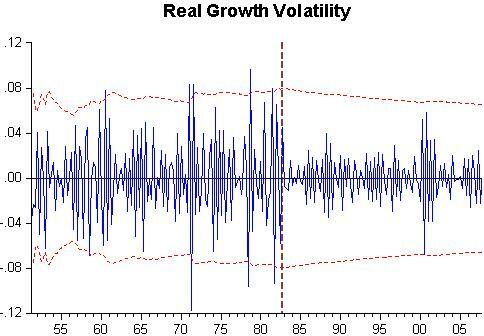 And the defining characteristic of the present “contraction” is that it gave us the first negative growth i.e. 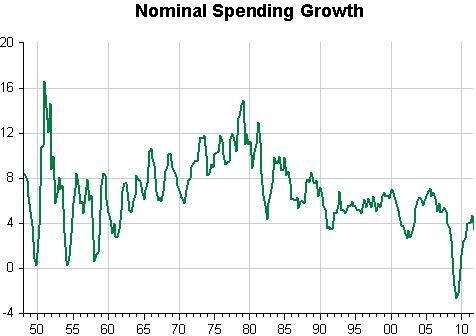 “contraction” in nominal spending (NGDP) since 1938, during the “second leg” of the great depression. The chart illustrates. And if look attentively at the charts JW presents, you´ll observe that in most the fall was the largest among the cycles compared. This means that although you might say that the “recovery is not just that unusual”, the economy (and most of its “categories”) is still “languishing” deep inside the “hole” it “fell into”. In other words, if you´re “crawling out” from a “deep hole” at the same rate (speed) that you “crawl out” from a “shallow hole”, it will take you much longer (and require much “suffering”) for you to again see the “light of day”. (Where the “light of day” is the LEVEL you should be at NOW if you hadn´t dropped into the “abyss”). Last week, the Dow reached the 13,000 mark for the first time since 2008, despite the daunting problems facing the global economy. This is suggestive of the old Wall Street saying that the stock market climbs a wall of worry. Investors tend to hold cash during economically uncertain times. And so, when their worst fears fail to materialize, they’re in a position to invest. By contrast, when investors are most confident, their money is, for the most part, already invested. As a result, the best rallies often occur when investors go from being very worried to somewhat less worried. There’s just one catch: It’s not hard for investors to slip back to very worried pretty quickly. If the economy fails to keep improving, today’s rally could easily sputter out. Given that the economy seems to have picked up recently and that average share prices have doubled from their 2009 lows, it makes sense to consider whether investors might have become overly optimistic. 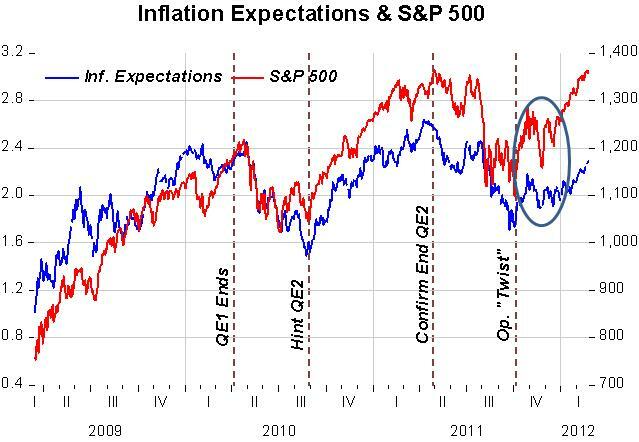 Since the crisis turned “ugly” in the fall of 2008, we notice a positive correlation between the stock market and inflation expectations. This “theme” has been well covered by David Glasner. In “normal” times the two series go “their own way”, but these are not “normal” times. As Michael Sivy argues, it´s not hard for investors to slip back to very worried pretty quickly and, as the chart shows, that has happened when inflation expectations “retreat”, which tends to happen when monetary policy is seen as failing to support economic improvement. 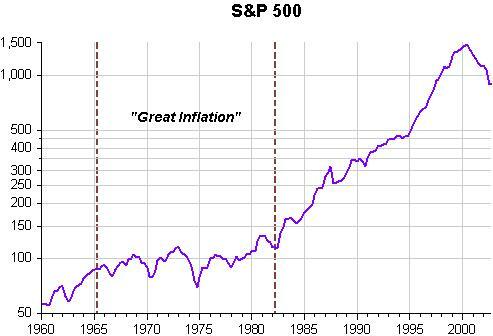 And since the FOMC has alternated between “on” and “off”, so has the stock market and inflation expectations. No, investors have not become “overly optimistic”, they are just “riding” the “sentiment wave”. And it´s a pretty “foamy” wave. Matt asks: Do High Oil Prices Doom The US Economy? But it looks to me as if a demand-side oil issue is really just the same old issue of the trade deficit and the international balance of payments and not the second coming of a 1970s-style oil price shock. Perhaps it’s a monetary policy issue. We send dollars abroad in exchange for oil, but then the dollars get sent back in exchange for bonds. That ought to lower interest rates and induce investment in the United States, but nominal interest rates are already at zero so the loop is cut. Even so, higher gas prices should push the price level up which pushes real interest rates down which induces investment in the United States. The chain will only be broken here if the Fed decides to ignore its own self-guidance and target headline inflation instead of core inflation. If you do what the ECB does and react to an increase in the price of oil imports with tighter money, then clearly higher oil prices slow growth. But that’s the ECB blundering (a specialty in Frankfurt) not oil prices strangling growth per se. Substantively, our results suggest that an important part of the effect of the oil price shocks on the economy results NOT from the change in oil prices per se, but from the resulting tightening of monetary policy. This finding may help explain the apparently large effects of oil price changes found by Hamilton (1983) and many others. The paper is obviously technical, so only the cognoscenti will be able to read it through. 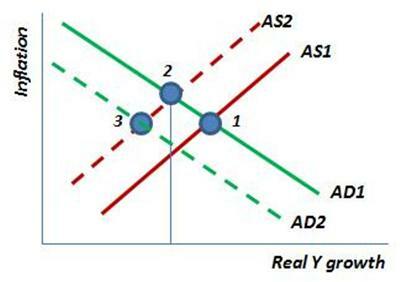 But no matter, there´s a very simple way to show why the conclusion makes sense, and also why Market Monetarists think it´s preferable to target nominal spending (NGDP), level target, instead of inflation (BTW, Matt is right in thinking that targeting Headline inflation is worse than targeting Core inflation). There´s no doubt, just imagining a dynamic AS-AD model that an oil price shock increases inflation and reduces real output, but the strength of the oil price effect on real output is predicated on how the Fed reacts to the shock. So it´s very frustrating, to say the least, to see that in 2008, when the economy was already nominally weakened from the fall in house prices and its effects on the financial sector, that Bernanke should have reacted to Headline inflation, which reflected the rise in oil and commodity prices, giving way to the largest nominal spending contraction since 1938. That´s the proverbial “throwing lots of salt in an open wound”. The pain just “shoots up”! This Joe Weisenthal post is very MISLEADING! In critiquing James Pethokoukis he could have done much better. What we get is a “war of bias” through badly conceived statistics. If only the first chart had been presented in the correct way – in log scale – the second and third charts of Weisenthal´s post would have been dispensable. The “Reagan years” were never about a “growth miracle”. A quarter of a century before Eddy Elfenbein “did a brilliant post pointing out that since 1951, the economy has basically grown at a steady 3.1%/year annual clip, year and year out”, it had been more or less established by Nelson & Plosser that US growth was “trend stationary” i.e. the growth trend was “constant” at about the 3.1% clip Eddy mentions. You can visualize this in my version of Pethokoukis chart (which covers the period from 1950 and shows Real GDP per Capita in PPP (i.e. comparable) dollars) presented in log scale. The US travels along like the proverbial “choo choo train”. 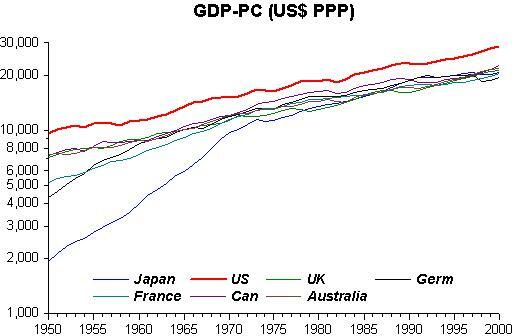 You can also see that after the war, ravaged countries like Japan and Germany grew much faster (just see the “steepness of the RGDP-pc slope) during the 1950s and 1960s. That´s what economists call “catch-up” (where programs like the “Marshall Plan” were extremely helpful). What the “Reagan years” and the years following were about, acquiring the sobriquet “Great Moderation”, was the steep drop in growth volatility. This is illustrated in the chart below. 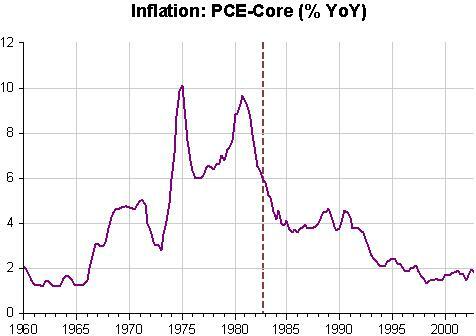 Better monetary policy (something which has more to do with the Fed (Volcker) than Reagan) was fundamental to the “conquest” of inflation seen in the next chart, which certainly had a role in reducing economic volatility. And “lo and behold”, see what those changes did to the stock market. Note that during the 17 years from mid 1965 to mid 1982, the S&P didn´t “budge”. During the next 17 years, to mid 1999 it increased by a factor of 14! And no, it was NOT a “long-running bubble”. So yes, the Reagan years were “special” in the sense that they ushered in a “different era”. Unfortunately Bush Jr, Obama & Bernanke “tried hard” and succeeded in “putting it all to waste”. St. Louis Federal Reserve Bank President James Bullard expressed optimism over the economic recovery on Friday, saying he saw a “real gain” in the recent decline in the unemployment rate. The Fed official also distanced himself from the specific language in the central bank’s latest policy statement. Last month the Fed said it expected to keep interest rates at exceptionally low levels until late 2014. Bullard said that he would have preferred not to include a “calendar date” in the statement. “Way out at the end of 2014, we don’t know what the economy’s going to look like and it over-emphasizes our forecasting ability, which isn’t that good,” Bullard told reporters at a conference on Friday held by the University of Chicago Booth School of Business. Bullard was largely hopeful about the economy’s prospects in 2012. “It’s reasonable to be optimistic,” he said. “Just because you had some bad shocks and things went badly in 2011 doesn’t mean that’s what’s going to happen in 2012,” he said. The probability of a severe meltdown in Europe is now lower, compared to last fall, he said. Bullard said he saw a risk that inflation could rise from its current level, noting a recent rise in gas prices and rents. While no asset bubbles were immediately apparent to him, Bullard did not rule out the idea that some could be developing. “It is a risk going forward,” he said. If we have trouble “forecasting the past”, imagine if it´s about the future! So the best thing to do is: set a clear (preferably level) target and then set policies that are expected to hit the target. What´s the use of having half a dozen or more different forecasts for half a dozen or more variables? The only “bubbles” that could develop in the present environment are those formed from the last breadth of those drowning if you “fill the hole the economy is in with water”! A top Federal Reserve official warned Friday that the current low borrowing rates enjoyed by the U.S. government will not last forever, and said elected leaders need to start getting deficits under control to prepare for that environment. “We are in an unusual period” where events, most notably the current course of Federal Reserve policy, have created a time of very low government borrowing costs, Federal Reserve Bank of New York President William Dudley said. “These challenges may be more daunting than fully appreciated currently,” he said. As he has in the past, Dudley cautioned against cutting deficits too aggressively, and told legislators they should be mindful not to increase headwinds too much right now, while the economy is still struggling to find its footing. “Fiscal consolidation should take into consideration the offsetting adjustments needed to keep the economy on an even keel,” the central banker counseled. He forgot to mention that MP has the most important role to play in providing the “offsetting adjustments”! Another suspect—one Mr. Obama doesn’t like to mention—is U.S. monetary policy. Oil is traded in dollars, and its price therefore rises when the value of the dollar falls, all else being equal. The Federal Reserve throughout Mr. Obama’s term has pursued the easiest monetary policy in modern times, expressly to revive the housing market. It has done so with the private support and urging of the White House and through Mr. Obama’s appointees who are now a majority on the Fed’s Board of Governors. Oil staged its last price surge along with other commodity prices when the Fed revved up its second burst of “quantitative easing” in 2010-2011. 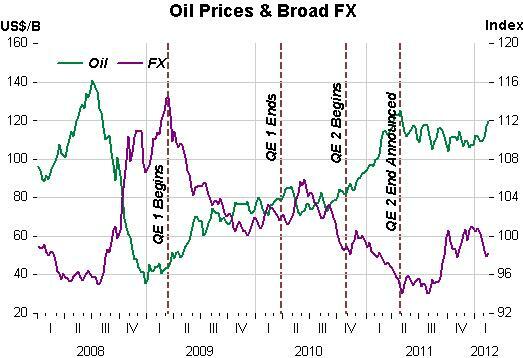 Prices stabilized when QE2 ended. But in recent months the Fed has again signaled its commitment to near-zero interest rates first through 2013, and recently through 2014. Commodity prices, including oil, have since begun another surge, and hedge funds have begun to bet on commodity plays again. John Paulson says he’s betting on gold, the ultimate hedge against a falling dollar. Fed officials and Mr. Obama want to take credit for easy money if stock-market and housing prices rise, but then deny any responsibility if commodity prices rise too, causing food and energy prices to soar for consumers. They can’t have it both ways, as not-so-stupid Americans intuitively understand when they buy groceries or gas. This is the double-edged sword of an economic recovery “built to last” on easy money rather than on sound fiscal and regulatory policies. Let´s take a look at the “evidence” for all those claims. If they´re trying to revive the housing market, they´ll have to “try harder”. 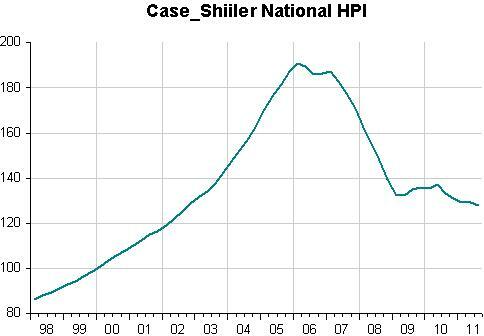 The C-S chart for National House Prices does not indicate a “revival”. The next chart plots the broad US dollar exchange rate (trade weighted against a broad set of trading partners) and oil prices on a weekly basis since January 2008. For the last 12 months oil prices have fluctuated little while the dollar is at the same level of one year ago, higher than a few months ago and at the same level it was in early 2008. And if monetary policy is “so easy”, why is nominal spending still “comfortably tucked inside the hole”? So when the WSJ talks about “surges” in oil and commodities at present and “easiest monetary policy in modern times” it is surely “exaggerating”! My preferred commodity price “story” is told by the chart below, taken from a post of one year ago. 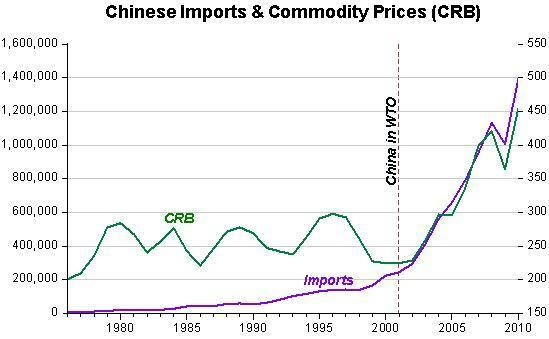 Yes, China in the WTO made a “world of difference”.